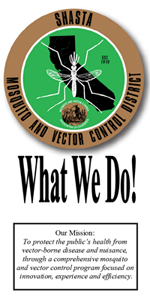 The Shasta Mosquito and Vector Control (SMVCD) is a special district, charged with the mission of protecting the public’s health from vector-borne disease and nuisance, through a comprehensive mosquito and vector control program focused on innovation, experience, and efficiency. The District operates within approximately 1,086 square miles of beautiful Shasta County; providing mosquito and vector control for Redding, Anderson, Shasta Lake City, Cottonwood, Palo Cedro, Happy Valley, Millville, Bella Vista, Mountain Gate, Castella, French Gulch, Igo, Ono, Shingletown, Viola and other annexed areas. The District employs 15 full time staff and several seasonal employees that are hired throughout the year. For employment opportunities, please see our Employment page.